Before I write another word, I need to make a confession. I have said before that I am obese. 300+ pounds at the moment. One does not get to this glorious number without eating. That’s just science. But here is the deal: I love food. I don’t mean that I like to eat so that my body doesn’t starve. Nope siree. We’re talking a deep, profound love of food. I like talking about food. I like picking out menus. I enjoy watching cooking shows. I revel in trying new restaurants and I am most in my element in fancy shmotzy ritzy places with menu items no one can pronounce. But above all, I LOVE food. I love eating, the explosion of tastes in my mouth, the delicate aroma of a well-seasoned meal, the beauty of an elegant plate presentation, the music of sizzling meat and crisp vegetables… Just writing this, my mouth is watering. Now that we have established that I am a pretentious snob when it comes to the culinary arts, let me tell you about the foods you would be wise to avoid. I know, I know. Associating the words “food” and “avoid” in the same sentence is sacrilegious. I’m sorry. There is no easy way to break it to you guys. Here is the cold, harsh truth: there are some foods that have been know to aggravate symptoms of fibromyalgia. And as saddening as it may be, my fellow Fibro Warriors, we need to be mindful of these triggers. Trust me when I say I am just as devastated as any of you that I may have to avoid foods I love. But in the end, I have to come to terms with the fact that I am not 100% healthy, and that comes with a price. If dropping certain foods from my diet allows me to enjoy life more and with less pain, heck, I’m game! Without further ado, I present to you the foods you should avoid. The food to top the list is sugar. Ok, I know. As a matter of fact, we ALL know that sugar is not healthy when consumed in large quantities. I mean, duh. The thing is, no matter how good we are at disciplining ourselves and not eating sweets, we still end up consuming sugar without even knowing it. So why is sugar bad? Science, that’s why. In a nutshell, the nervous system in our body needs sugar to function. It is one of the main factors allowing nerves to subsist. However, when sugar is absorbed in excess quantities, the nerves cannot utilize all of that sugar. So they absorb more water – that kinda makes sense when you think about it. ow in parallel, while all this sugar/water system is building up, the nerves’ protecting shield, called the myelin sheath, starts degrading because the “balance” or ratio of water to sugar is off. The process is called demyelination. And that is where the problems begin. Demyelination results in breaks and tears in the myelin shield. The myelin is the fatty tissue that allows for a good transmission of the nerve signals within the nerve cells, and between cells all the way to the brain. If the signal is disrupted due to demyelination, the nerves are now sending all kinds of wonky signals. Wow. Science. Complicated mumbo-jumbo, if you ask me. What does this mean in real people words? Simple: sugar accelerates the degradation of your nerve cells, resulting in neuropathy, which means all kinds of ouchies. As I briefly mentioned earlier, sugar finds its way in all sorts of products we eat. Take ham for example, or yogurts, or even milk! All of these have a natural content of sugar in them, but for a taste boost, some manufacturers will actually add more sugar! So how do you deal with this pitfall? Get used to reading labels. I know it’s not a fun way to go grocery shopping, but after a while you will get used to looking in the right spot on the packaging. In the US, many products now are obligated to list the sugar content, among other things, smack on the front of the box. Society as a whole is slowly becoming more and more aware of the issues we face when eating too much sugar. 2- Make up your mind already! Sugar is not good for you is large amount. Great. Let’s get sugar-free stuff! WRONG! Don’t fall for the marketing gimmick that “sugar-free” has become. Think about it: you buy sugar free stuff, yet it tastes sweet. Hmmmm…. And there is a reason why it is so sweet… Have you ever looked at your cereal bowl in the morning (or any time of day, to be frank) and wondered who thought it would be a good idea to make raspberry flavored foods blue? Have you ever seen a raspberry? Is it ever blue? There is a huge correlation between the colorful cereal and the unhealthy one. Looking up facts about different brands of cereals’ sugar contents, I am horrified to say that some cereal are up to 56% sugar! To put this in perspective, imagine you’re having 1 cup of corn flakes. To arrive to the same ratio of refined, artificial sugar than some of those sugary brands, you would need to pour over half a cup of granulated sugar in your bowl. HALF A CUP OF SUGAR! And then realize that, on top of the fake sugar, you’re dealing with dyes and other additives. It’s really kind of crazy. How does that relate to fibromyalgia? Easy. The more chemicals and artificial products we put in our bodies, the less likely our bodies will be able to recognize them, process them and use them in place of whatever it is they were supposed to replace. So in the end, our bodies are confused. Wait a minute… isn’t that what fibromyalgia is all about? A confused body? 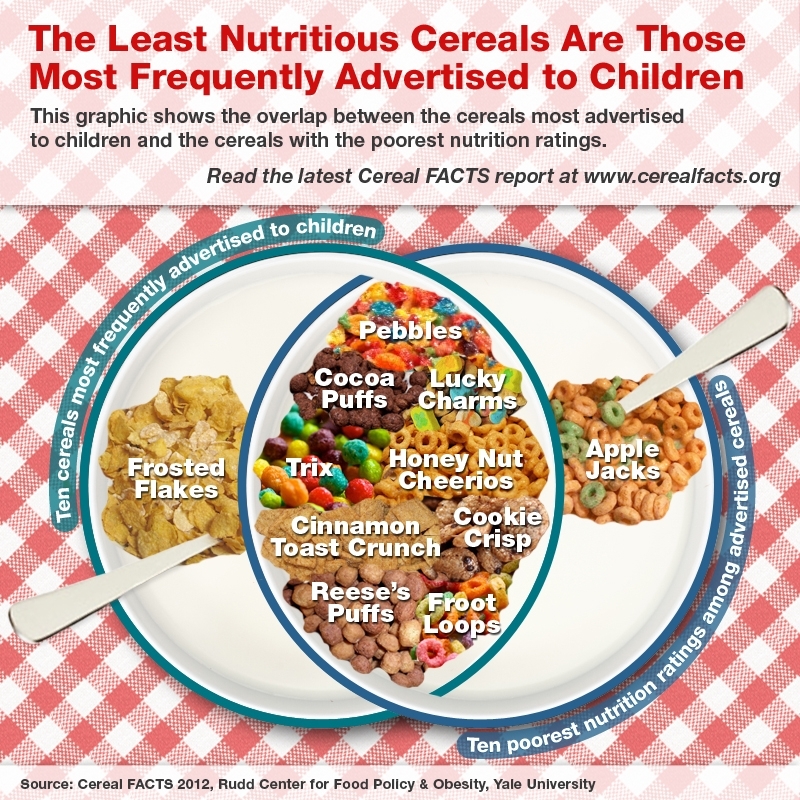 Here is a good info graphic from cerealfacts.org, a partner of the University of Connecticut ‘s Rudd Research Center. 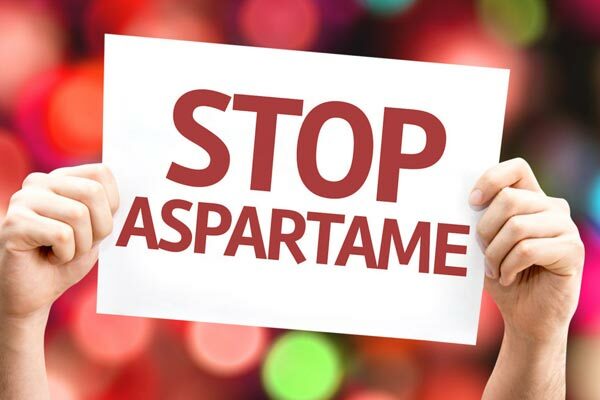 Before I go further, let me say that I understand that aspartame has been shown to be safe for human consumption pretty much worldwide, except for individuals who suffer from a rare genetic condition called PKU (phenylketonuria). With that said, let’s not kid ourselves. Aspartame remains a synthetic, man-made lab experiment. You will never find aspartame in nature. Ever. So now that we’ve established that aspartame was not around for a long time, but now is everywhere, how does it link up to fibromyalgia? A lot of studies have shown aspartame to be safe for human consumption. Fine. But a recent study had also shown that fibromyalgia symptoms were greatly improved in individuals who cut out aspartame from their diets. And you know what? That’s good enough for me to kiss aspartame goodbye! 5- No vowels = not good for you. Here is a quick way to understand why consuming too much “sugar free” and sugar substitute foods isn’t as good as you’d think. The first thing is marketing. Dang, those people are good. They play on our weaknesses and our desires to lead a healthier lifestyle by telling us that sugar free foods are “diet foods” we can eat guilt-free. Except that, like anything else in life, moderation is crucial! Unless you can trace back the sweetener to an actual food group, it was most likely made up in a lab! Rule of thumb: if you can’t pronounce it, don’t eat it. The FDA has approved a list of six high-intensity sweeteners – these are sugar substitutes that taste a lot sweeter than actual sugar when quantities are comparable. In other words, a teaspoon of stevia will be sweeter than a teaspoon of cane sugar. Why are sweeteners bad? For one, they have not been around too long. Who knows what kind of ok g-term damage we are doing to our bodies. 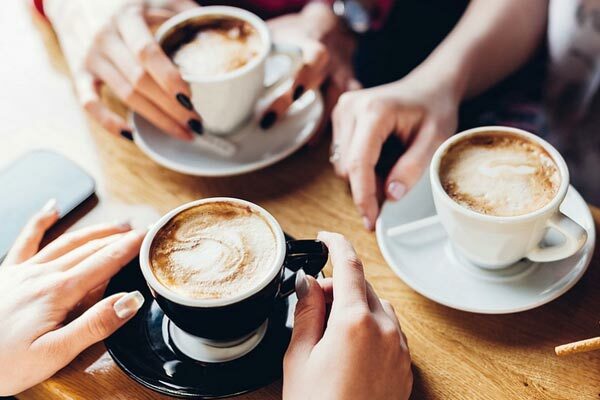 From the FDA (Federal Drug Administration) website, you can find a table that explains a little by more about the artificial sweeteners we may encounter every day, and what amounts are safe. 6- Kick that diet to the curb! We demonstrated above how artificial sweeteners, and aspartame in particular, could really mess with your system. So yes, putting diet pop (hello Minnesota!) on the list is a bit redundant. Let me tell you, though, that from personal experience, I find it easier when things are clearly spelled out for me. And now you must suffer through my redundancy! Mwahahahaha!!! Oh, hmm, sorry about that…. As I was saying, it’s a good reminder to put diet sofas on the list. We have been told time and again that sugary drinks are not good for us. For goodness’ sake, they even put the word DIET in there! Realistically though, the sugar is replaced by something we know has been engineered in a lab. How good for us can that be? I always had a pack of gum in my purse. Here I was, once again trying to do the right thing, and once again falling for marketing tactics. I should have known better. Almost all chewing gum in the market these days are sugar-free gums. But much like the diet pop I drank because it was “diet,” turns out sugar free gum is not sweetener free gum. But no, sadly, sugar alcohols are not nearly as fun as their name implies. Sigh. They are just another type of sugar substitute used to replace, you guessed it, sugar. Some types of sugar alcohol include sorbitol, xylitol, and many more “-ol” products. According to the FDA, “the sweetness of sugar alcohols varies from 25% to 100% as sweet as sugar.” What it means is that the sweeteners may be lower in calories than regular sugars. It is tempting to just think, “Score,” and reach for that pack of gum. Not so fast, my dear Warrior. 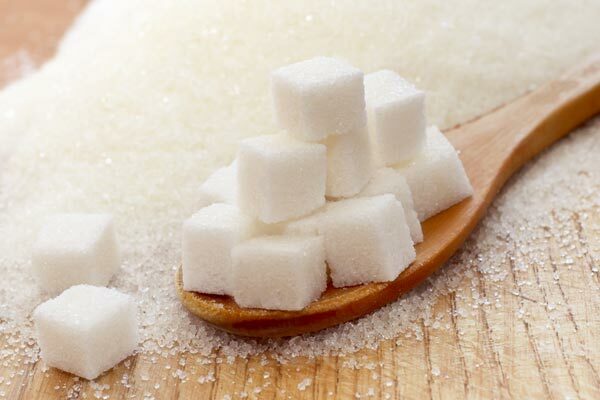 Several studies have shown that there is a strong correlation between sugar alcohols and weight gain (see https://www.ncbi.nlm.nih.gov/pmc/articles/PMC2892765/). And as we know, the heavier weight your body has to lug around, the harder on your system. And when things are hard, your body works overtime, leading to exertion. So there you have it. There is a relationship between the use of sugar alcohols as sweeteners and Fibromyalgia. And to me, it’s not worth the risk. can almost see it: it’s 1988, and some ad exec with a ponytail and a receding hairline, donning a fluorescent pink cropped t-shirt under his two piece white suit à la Don Johnson, in a meeting with the higher ups who are trying to make more money, more money and even more money. Blank stare around the board room. And just like that, calorie-free flavored water was invented. Let’s pause and think about this for a second. It’s water, therefore it has no calorie. I get that. It it’s also sweet and taste nothing like water. It also has an extended shelf life, so clearly it’s not an organic (i.e. From nature) product. Wanna take a guess at what is making it sweet? Yep. Artificial sweeteners. Again. Ugh. Thank you, but I think I’ll pass. 9- Don’t drink the Kool-Aid. An alternative to already pre-mixed flavored water is drink powders. They look like long sugar packets, and the powder looks like pixie dust. And sometimes they come in envelopes, like dehydrated gravy. And if you’re really thirsty, you can get drink powders by the canister so you can produce gallon about gallon of artificial deliciousness. Yes, I said it. It’s delicious. I love pink lemonade powder. But once again, the number of unpronounceable ingredients is baffling. See for yourself. Below is the list of ingredients from an American pink lemonade product. I am not a chemist, or a pharmacist, or a doctor, or any other kind of smart people who can understand this. I have no clue what Sodium Hexametaphosphate is. Zero. Clue. None. So why would I want to drink it? I mean, if someone off the street told us to drink something containing diphacinone and bromadiolone, but that it’s ok because it had no side effect and will not cause a Fibro Flare, would you do it? Of course not! And you’d be right, by the way, because those are the main two ingredients in rat poison. Yes and no. No, I haven’t tried it myself. But yes, I’ve read countless sources during my research for this article that cited studies showing a strong relation between going gluten-free and having less musculoskeletal pain. Therefore, I tend to think that gluten might not be that good for the body. Gluten is one of those things that your body cannot really absorb. It is a protein found in many grains, thus in many flours as well. Gluten can also be found in many other food items, as it serves as a coagulant agent, something that holds things together, a sort of glue. Due to these properties, it is used as an additive in many processed foods that otherwise would be liquid or gelatinous – think lunch meat. A derivative product of gluten is amidon. Amidon allows for the gluten proteins to be soluble. Without amidon, gluten cannot dissolve in liquids. Add to that the fact that grains have been genetically modify to have more this and less that… and voila! Perfect combination for an unbreakable gluten! What do you think happens to things you ingest that your body cannot process? Right, it is ejected out of your body. But here is a trickier question: what do you think your body does when it cannot absorb a protein it needs, like, say, gluten? Your body works harder to compensate for the lack of nutrient it is being given. That results in aches and pains pretty much everywhere, because our body is sending signals that it is out of balance. Your nerves pick up the wrong kinds of signals and… Fibro Flare. This one goes hand in hand with gluten. 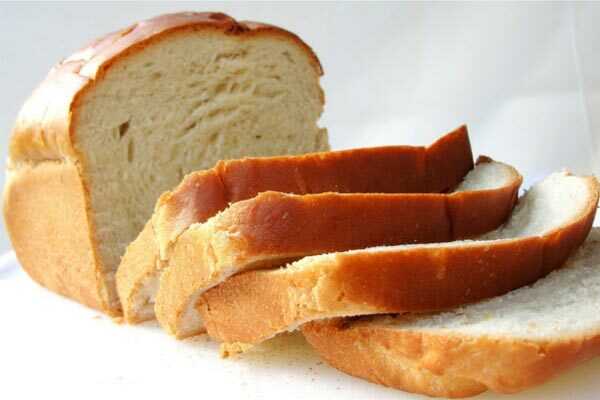 Oftentimes, yeast is found in breads that were baked with gluten-filled flour. As a result, it makes it kind of difficult to differentiate between the effects of gluten and the effects of yeast. But there is good news: if you limit or eliminate your gluten intake, chances are you will automatically eliminate your yeast consumption also. It’s a double whammy! The theory behind the yeast connection to fibromyalgia is controversial. Some health professionals believe that an over consumption of yeast leads to the overgrowth of a gut yeast called candida. Now everyone has this type of yeast in their gut. It is part of the normal intestinal flora. But too much yeast can create digestive issues. As a result, when you make the effort to take yeasty foods out of your diet, your risk for gastrointestinal troubles is significantly reduced. 12- Simple is not always better. I am referring to carbs here, of course, not math. Because in math, simple is always better! Carbs is a short way to say carbohydrates. Carbohydrates, along with fats and proteins, are essential to human survival. Without carbs, we die. But here is a little secret: carbs are not just your breads and your pastas and your crackers and cookies. Nope. You can find carbs in vegetables and fruits, too. The difference between the carbs is that some are simple and some are complex. The complex carbs take hours to be processed by our body, which turns the carbs into energy. Simple carbs on the other hand are processed super fast. They give you a quick boost, but when they’re done producing the energy they need, they’re done and gone. To avoid hypoglycemia, which is a sudden drop in blood sugars, our bodies need a sustained source of carbs. In todays’s world, it seems a lot easier to mindlessly consume simple carbs than it is to conscientiously choose complex carbs. What I’m trying to say with big words is that the more simple carbs you consume, the more fatigued you will feel. When the body is done processing simple carbs, it crashes, unable to find energy to go on. Just kidding! Don’t change who you are! But definitely be mindful of refined flour. Evidently, as seen above with gluten and yeast, refined flour is found in today’s breads and bread-like products, because it is mass-produced to have a crazy long shelf life. There is a reason why your bread takes so long to get moldy, and even then, it doesn’t get hard for days on end. Refined flour, like most refined products, means that it has gone through a process other than just harvesting and grinding the grains. In addition to the usual suspects that are gluten and simple carbs, there is one other problem with refined flour – which is the flour you will find in most “white breads,” by the way. The issue is that it has been stripped of “unstable” components, or in other words, components that are susceptible to spoil fast. Unfortunately for us, the consumers, these nutrients are essential to a well functioning body. So not only do you stock up on amidon-free gluten and simple carbs, but refined flour also lacks the nutrients that make grains the part of a good balanced diet. What does that mean for Fibro Warriors? It means you are consuming empty calories, which your body needs to work double time to break down. And that, my friends, would be the root of what is commonly referred to as inflammation. I don’t know about you, but I sure don’t need additional triggers for my inflammatory response. I know I just spent the last 10 minutes lecturing you on why you should avoid refined flour. And here you were, thinking it was all good since there are so many whole grain options out there nowadays. But here is the deal: whole grain or not, bread remains a simple carb, tough on the body. I’m not going to go into it again (see the bullet point about gluten, then the one about simple carbs, and finally the one about refined flour). I need you guys to remember that I am writing these articles for you, but also for me (typical selfish Servanne behavior!!). What that means is that I need to have actual visual reminders when I make/read lists. Good try, Future Me. But you won’t win this time. You know the type. You’re walking home at night, and you decide to take the shortcut through that one dark alley no one ever goes through. And there, in the shade, the big bad mean veggies are waiting to ambush you… What?!? No! Not that kind of shady! In fact, this is something I learned about doing research on foods to avoid. Apparently, there is such a good category as nightshade vegetables. Ok then. What’s a nightshade vegetable, you ask? Well. You know. It’s a vegetable. And it’s night. And… ok hang on a minute. Lemme figure this out, because honestly, I have no clue. (20 minutes later) OK, so according to people smarter than me, nightshade vegetables are plants that prefer to grow in the shade, and bloom at night or in the evening. These include tomatoes, eggplants, potatoes, all kinds of peppers, etc. The problem seem to stem from two thoughts: these are plants where only the fruit and roots are edible (then again, isn’t that most vegetables?) and, they are packed-full of alkaloids. Alkaloids, yes, of course. Just kidding. I had to research that too. Turns out alkaloids bind strongly to cholesterol in the cells, preventing the good kind of cholesterol from doing its job, and in the process disrupting the balance within our cells. According to what I read, science science scientific science stuff science. Or in normal people talk, it’s a big no-no. On top of that, turns out that alkaloids act on some neurotransmitters. Don’t ask me which ones. But without going into too much details, it’s a safe bet to say that if neurotransmitters are affected, the signals between the nerves and the brain will be affected as well. And that I understand, because it results in me being unable to move due to Fibro Flares. I’m not saying you should avoid veggies all together, but it’s worth a bit of research to see if maybe there is something to it. The cow, that is. This one seems a bit understudied, in my opinion. Some small studies have found that fibromyalgia patient are sometimes also lactose-intolerant. So avoid milk. I do have two concerns about this theory, though. 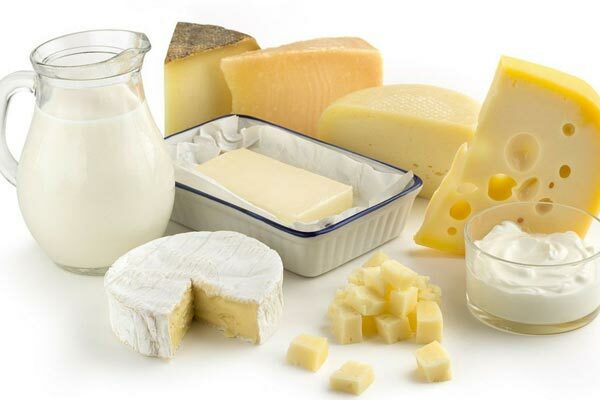 First of all, urging people to cut out dairy could lead to calcium deficiencies, and that would not be good, especially considering the increased risk of osteoporosis and osteoarthritis associated with calcium deficits. The other issue I find with this is that often, Fibro Warriors also suffer from gastrointestinal troubles, whether as a direct symptom of fibromyalgia or as a comorbidity. How can we distinguish between an intolerance to lactose and a bowel inflammation due to fibromyalgia? Cutting out dairy to figure it out could be one way to do it, but what if you actually have an intolerance to the added vitamin D in milk, or the added hormones in some white milk? I feel like t would be hard to discern. 17- She sells seashells by the seashore. Or try this one for a tongue twister: say monosodium glutamates really fast ten times! Monosodium Glutamates are commonly known by their cute nickname: MSG. Ok, it’s not a cute nickname. Still. That’s what most people know them by. What are MSG? They’re excitotoxins: molecules that excite, or fire up, some neurotransmitters. If you consume an excess quantity of MSG, then your nervous system will not like you very much. It will have to work overtime and holidays at regular pay. But your nerves really don’t want to do that. So how are they going to retaliate? Easy: either they stop working, or they do a poor job. Either way, you lose. How do you fix it? Read labels. It will take you a nice long while grocery shopping g at first once you have a list of the things you’d like to avoid. It should be smoother sailing after a few trials and errors. By law, MSGs must be disclosed on the nutritional labels or the ingredient list, so make sure to take a closer look at the packaging and put the MSG-laden goodies back on the shelves. On a side note, MSGs are flavoring agents that make our brains think our foods taste better, all the while creating an addiction for the next high (yes, like drug addicts), therefore making us crave the products even more. Interestingly twisted, isn’t it? 18- More of the same. This time, we will look at Sodium Nitrate. Very much like MSGs, sodium nitrates are additives used to preserve food, and also enhance flavor. It’s a cheap way for manufacturers to have better tasting products without having to spend the money on better or different ingredients. The problem with nitrates is that they are found in a LOT of foods, from processed meats to processed cheese. Come to think of it, if it had “processed” in its name, it probably has nitrates. Nitrates have inflammatory propensities and have been shown to provoke intense Fibro Flares. Not my idea of a good time… Sure, processed foods are cheaper. But really, your health is worth it: try to avoid artificial flavor enhancers and additives as much as you can. What I’m about to tell you will make a few of you unhappy. And a whole lot of you downright furious. Caffeine isn’t good for you. Trust me, I like the caffeine boost as mush as the next gal, but here I think moderation is key. First of, caffeine acts as a diuretic agent. That means it makes you go to the bathroom a lot more than the same quantity of water would, for example. Now that you’re dehydrated, know that caffeine also acts as a potent stimulant. Cue the restlessness. Now that you’re shaking out of your mind, and sleep deprived, you should understand that caffeine exacerbates anxiety. Now that you’re anxious as all get out, you start thinking too much about negative influences in your life. Enters the depression. Phew. And this was only your fourth cup of the day! 20- Woman, this is crazy talk! In the interest of spelling things out clearly, here goes to nothing. 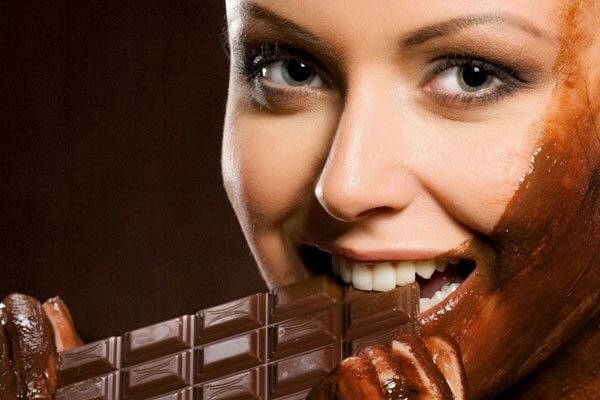 Chocolate has tons of caffeine in it. There. I said it. You can hate me now. Don’t worry, I hate me too for writing this. I mean, chocolate. Chocolate? Chocolate! Ugh. 21- You’re about to see red! Even more than before, if that’s possible… I’m starting to feel like the ultimate fun crusher! Red meats tend to have a higher content in fat than poultry, for example. The extra fat makes your body work harder for less useful nutrients. In addition, the excessive consumption of red meats seriously amps up your intake of mono saturated fats. That means that your arteries will be under attack from all that fat, and hey will stiffen. What does that really mean? Your arteries will send signals of abnormal behavior to your brain, and in the end, your brain will interpret these signals as pain. In reality, lean red meats are still an important part of an balanced diet, but you may want to consider not serving red meat at every meal. It kind of sounds like an advertisement for an ultimate fighting match. Ok so maybe my imagination needs to slow down a bit. But here is the thing: just as we need to be mindful of our own alimentary intakes, we should also take a closer look at what our food eats. What is the point of reducing gluten consumption, for example, if we eat gluten-fed cows? It just doesn’t make sense. I know that organic foods, natural foods, grass-fed and free-range foods are typically more expensive than mass-produced foods. 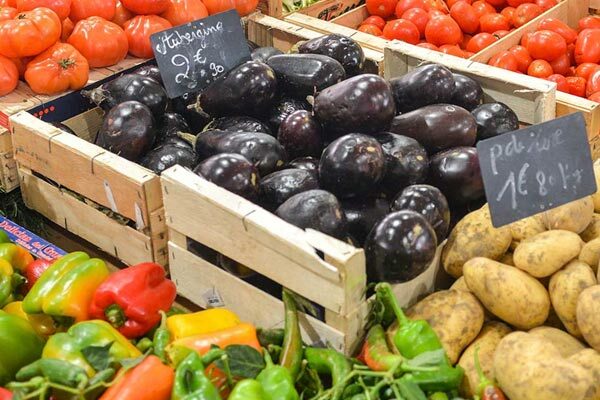 Trying to buy the healthiest foods can be an economic hardship for many of us. We need to keep in mind that the end result is worth it If that means replacing one meal here and there with the “better” stuff, then it is progress and it is wonderful. 23- It’s a long process. Are you going to eat that? No, seriously, are you actually going to EAT that?!? If I were you, I’d think about it twice. Just saying. Processed foods are everywhere. To tie in with the point above on grass vs grain, it is undeniable that processed foods are much more affordable than their less processed counterparts. Now of course most of our modern food products are processed in some way or another. That’s ok though. What we commonly refer to as processed foods is food a that have been altered by some sort of chemical reaction. Why is it bad? Well, for starters processed foods often contain additives or artificial enhancing taste agents. If you look at a food label and it has more than 10 ingredients, including some words you’ve never seen in your life before, let alone pronounced, then chances are you’re looking at a processed product. I’m not going to go over the whole artificial thing again, but you know it’s not all that good for you. On top of that, there is a higher chance that trans fats were used (more on that below). You will find less nutritious ingredients, more simple carbs and more fat products. Add the fact that your body doesn’t work in the same way to break down processed foods, and the result is less energy is burned at that stage. More calories consumed + less energy burned = stuff that stays on our bodies instead of being transformed into fuel. …but not your vegetable oil! Wait, what?!? Another contradiction? It’s becoming a habit! Joking aside, vegetable oil does not count as a serving of vegetables anymore than ketchup does. You’ve probably heard before that there are different kinds of fats. We will look at that closely in a moment. Just know that the kind of fats that are found in vegetable oil are called Omega-6 fatty acids. Omega-6 fats have been proven to drive up inflammation in your body, as well as oxidation of your blood vessels, in this case the arteries, not the veins. Why is oxidation bad? It leads to atherosclerosis. That means your arteries are getting clogged by a plaque forming when the “bad” fats cling on to the “good” fat cells. Since the bad fat cannot be used, it just hangs out, like a teenager in his parents basement. After a while, the cholesterol-related plaque can lead to heart diseases. But before it gets to that point, it will cause increased inflammation (read: pain) throughout your arterial system. I have no clever header for this one. Saturated fats are the bad boys of the fat neighborhood. What is a saturated fat? It’s a fat that cannot “accept” anymore molecules to join it. Therefor it stays the same. Forever. What is that fat saturated with? Hydrogen. Sure, we need hydrogen to survive. But the bonds within the saturated fat molecules is so strong, it remains solid at ambient temperatures. And at body temperatures. Hello, cholesterol. Just as an FYI, unsaturated fats are liquid at room temperature. They also break down easily, which makes them absorbable (is that even a word?). The more absorbable (if it’s not a word, it should be) the fat, the more useful to your body. What does that mean for Fibro Warriors? Simple: unsaturated fat are easier to process than saturated fats. Therefore your body work less, reducing the fatigue level and its buddy, inflammation. Which means less pain. Yay! Go less pain! 26- This is no small fry. Fried foods are delicious. Fried foods are an American staple. Fried foods are what make any backyard gathering a success. Fried foods are the diggity bomb. But let’s not kid ourselves: fried foods are not good for us. To fry food, you dip it in fat that has been heated up so much it scorches the outside of your food, before penetrating the very innards of said food. Does that sound healthy to you? It doesn’t sound healthy to me either. For all the reasons given above and below about different kinds of fats, and for the love of all that is good in the world, please don’t eat too much fried foods. Your body and your nerves will thank you. 27- Jack of oil trades. Pardon the bad pun. We’re talking trans fats here. Nope. Not the plus size Eve who used to be Adam. But rather the type of fat one can find in almost all veggies. Ahhhh!!! I’ve gone mad!!! Veggies are bad for you now? What’s next? I can’t dare to imagine! Enough of that. Trans fats are a derivative product of vegetable oils, obtained by a process called hydrogenation. In essence, hydrogen is forcibly added to vegetable oils so it can bind to the molecules and expand its mass. The more, the better. Choosemyplate.gov is a good resource to find alternatives to the “bad” fats. Here is a nice visual found on this government website. Yes, that is a reference to the worldwide fast food chain you are thinking about. This is quite self-explanatory. Fast foods of all kinds, not just the clown one, are as a group less healthy than home cooked meals. Duh. But you know, I’m weak. I’m a weak, weak person. I need things spelled out for me Blackmon white, otherwise I try to justify “this one time only” type of binges. So there: limit your fast food trips. The high fat content of most products combined with the tons of additives, preservatives, enhancing flavor agents and gluten-filled meat and bread, this is equivalent to troops invading your body, fighting every inch of it. Your body under attack does not feel good. Avoid it. 29- One last one for the road. I’m not kidding. This is not even one but funny at all. I am telling you that alcohol is bad for your Fibro Flares. Put your wine down. Leave that beer in the fridge. Stop doing handstands on that keg (oh please – don’t act like you don’t know what I’m talking about). We have all read those reports that tell us one glass a day is good for you and what not. But look, fibromyalgia often comes with its best friend, chronic fatigue, and their acolyte, bowel issues. While alcohol may not have a direct effect on your fibromyalgia symptoms, it will without a doubt irritate your bowels and exacerbate your fatigue. Be reasonable. Drink with moderation. And don’t drink and drive. Seriously. That stuff is not tasty to me. At all. That’s why it made the list. Ugh. 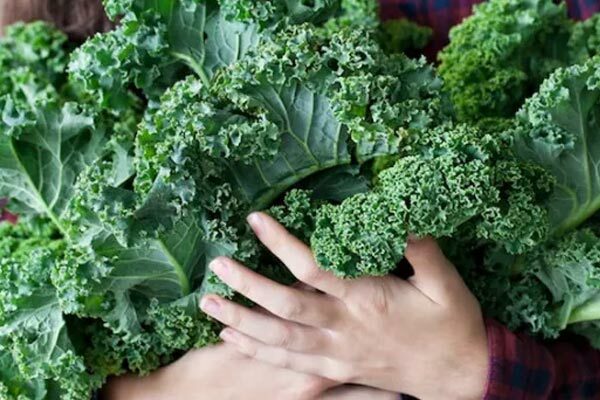 I do NOT like kale. So in conclusion, like always, consult with your health professional or advisor. You don’t want to leave your health into the hands of the internet (which I imagine are tiny little T-Rex hands trying to catch our souls, but who can’t do it because it’s tiny arms are too short). Ask around what people you know think about these foods to avoid. Remember that everyone is different. What works for me may not work for you. Happy eating, and keep up the good fight, Warriors! Interesting but since I started LCHF/Keto I am feeling better. And I eat cheese and lots of fat. No grains or sugar though, and rarely any fruit. 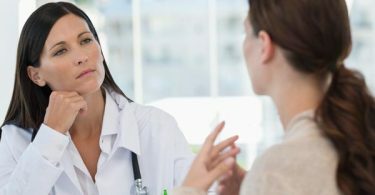 thefibrowarriosrs.com — is that right? Is that truly a bunch of assorted humans who have their assorted symptoms of fibromyalgia and share with each other their good, their bad, and their ugly—with no condemnations and no whining? If that is true, then I know why I have tears in my eyes right now. I don’t want pity, well maybe a little bit of pity and understanding. I want someone(s) to know that I have not asked for this, I would never want this for my worst enemy, and I’m trying my best every day, every hour to be strong and “normal.” I am in a battle that I can only hope to endure, never to conquer. I will always try to be as little trouble as I can. I will try to complain less. I do need understanding and support from anyone who can give that to me. I appreciate support more than I can ever say. To know that there is a “family” out there who know what I mean is truly a deep joy for me. I love you all. You expressed what I’ve been feeling for so long. It means a lot to me. I just want my friends and most of all my family to understand I didn’t ask for this. Just help me through it.